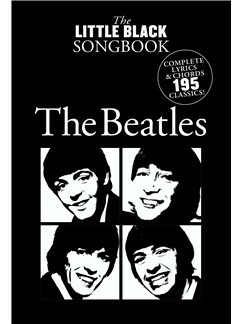 ‘The Little Black Songbook of the Beatles‘ is an amazing place to start. 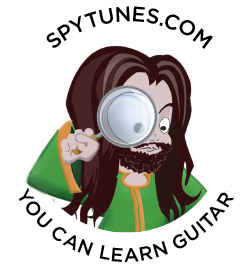 The first tip you’ll come across when you start learning guitar is to use songbooks. These will have the lyrics with chords printed above certain words. These days, most find this stuff online on websites such as e-chords.com. In some books and on some websites, you may even get the chords shown to you as images in little boxes. In order to make sense of this, you simply must be familiar with the song itself as there is no indication of tempo, time or key signature, or what to actually play and sing once the chords are fretted and the lyrics semi memorized. These are great qualities for a musician to have. Being creative with your arrangements like this is good training for when you eventually write your own songs and/or jam with friends. The main problem with just learning more songs is that you never dig deep enough to see how each song is constructed and work harmonically. This is a shame as it’s then difficult to apply the knowledge you’ve gained from one song to the next. For the beginner guitarist, very often, enough time isn’t spent on building a great guitar part with the chords at hand. Again, if you don’t fully understand how the song is constructed, this is very difficult to do without simple trial and error, followed by writing your part in TAB and memorize it. To break away from this pattern of just learning more songs and collecting TAB, perhaps thinking,’ if I just do this enough, I’ll somehow get better’, is very important. Of course, you must build a repertoire in order to play with other musicians but without digging deeper, what you’ll miss is to learn music as a language. What you lose out on is the ability to ‘speak music’, to feel confident in that you know what you’re doing. To take a step towards this journey, the first thing you must do is to stop thinking of chords as just a name and a shape. Although having shapes and names are very important, it is the number, the roman numeral, that matters the most. I remember learning ‘Time Of Your Life‘ early on. The chords were G C D and later on an Em. I also remember learning ‘Stand By Me’ using these chords: C Am F G.
I wish my teacher had pointed out to me that these are in fact the same chords, just in a different order. If I had had that experience early on, the path would immediately have been clear. You may be thinking, but those are not the same chords?!? But they are. They are the same, just in two different keys. If I was to play ‘Stand By Me’ in G (Same key as ‘Time Of Your Life’) then the progression would have been G Em C D. That’s the same chords, just in a different order. The new beginner sws show you what chords belong to what key. At the beginner level, only the keys of G and C are available. As you move on to the intermediate sws, all those chords that you’ve been learning as shapes become just that, in the form of barre chord shapes. Very often, the part about how key signatures work, seeing chords as numbers is put on the back burner, moving on to learning barre chords first. Don’t do this. Instead, take all those songs you know already and work out what key they are in, what each chord is, as a number, or more specifically, as a Roman Numeral. What you’ll find is that each roman numeral has a certain sound, this is the first step towards understanding music as a language. Overlooking this is by far the most common and easily the biggest mistake a beginner could do when learning songs on the acoustic guitar. As you’ll find in the beginner course, we only need to learn nine songs before we move on and become intermediate players. Personally, I learned more than fifty songs before I took that step towards barre chords. This took me several years, for no good reason whatsoever. Another often overlooked topic is rhythm playing. Most beginners have one or maybe two strumming patterns that they apply to every song they come across. Again, this is so unnecessary but still, understandable. The songbooks, lyrics with chords and TAB sites ignore the rhythm, so as a beginner it may seem as if that’s what we should be doing too. Nothing could be further from the truth. On guitar, we execute rhythms by playing either with a down or an upstroke. How I wish my first teachers told me that this should have been played with the right hand keeping a pendulum movement throughout, all those rhythms could then be so easily translated to rhythmical symbols! This is in fact so easy that the beginner course only needs nine songs (as mentioned) and just fifteen strumming pattern exercises to get you going. In this video, you can see how the down and up strokes correspond with how you write rhythms. Fret a G chord, move the strumming hand up and down and aim to see the connection between your up and down strokes and the rhythmical symbols. This example used 8th notes, meaning your hand needs to move at 8th note pace. This means you travel down on the beat and up in between. In this next example we play at 16th note pace, now you travel up and down twice per beat. If you can’t play an E9 chord, simply play an open E instead as you strum along with the video. These were my ‘biggest beginner mistakes’.